The repurposed writer: If sitting is the new smoking, I'm a victim of second-hand sitting. If sitting is the new smoking, I'm a victim of second-hand sitting. I went into the magazine room of the library today and a cover headline on Runners World smacked me in the face. Sitting is the smoking of our generation. Sitting is as bad as smoking. If that is true, I’m a four pack a day addict because if someone asked me what I do all day I would say, “I sit.” I think I got the sitting addiction through “second hand sitting.” Everybody around me was sitting and I was too timid to tell them to stop it. By the way I have a professional grade treadmill used only as an odd toy by my toddler grandchildren who call it a twedmoh. I keep it just to hear them say that. 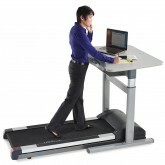 They now make treadmill desks and the company that makes them is called LifeSpan. Get it? There’s a Ted talk on sitting and when there’s a Ted talk, you know it’s more serious than Dr. Oz or Dr. Phil. It’s Charlie Rose serious. We used to go to church to get a sermon but now it’s Ted. Sitting has become the smoking of our generation, says Nilofer Merchant in her Ted talk. We sit over nine hours a day, more than we sleep. In her office she has instituted walking meetings and racks up 20 to 30 miles a week. She says fresh air drives fresh thinking. There is no nice wrap up to this story. I just thought I’d let you know what’s going on. Something more interesting about walking is how it helped Francine Shapiro, a psychologist, discover a very effective therapy called EMDR. She was dealing with a big emotional issue and noticed that as she walked in the park, her eyes darted from side to side. When she finished the walk she felt better. That was the first stirrings of EMDR (eye movement desensitization and reprocessing), an excellent therapy that helps one process big psychological boo boos quickly. If you like the idea of getting well fast which will make you sit less, check out EMDR. Right before Psychology Today was O Magazine with a big Oprah on the cover. Here’s what’s inside O for July. 50 things that will make you say WOW! Summer hair repair kit. Superfood Smackdown. Even though she doesn’t have a talk show, Oprah still wants me to live my best life. Ok, Oprah, but first I have to get up off the couch. What are Kate and Will doing all day? "Let's go Wills. It's coming."